Spacious villa with over 390 square meters of living space. Four fully furnished, air conditioned bedrooms - three with en-suite bathrooms. Four bathrooms each with hot water shower, and power point for razor. W/C on games room floor. Three living areas including the spacious Penthouse open plan lounge/diner with vaulted ceiling. Each living area has a wall mounted LCD HD TV, home cinema system and satellite TV. The Penthouse lounge has a 50" TV with Yamaha Dolby 7.1 home cinema system. King sized beds in The Penthouse and queen sized in the apartments. Wall mounted LCD HD TVs in The Penthouse bedrooms with media players. Large fully equipped kitchen in The Penthouse . Fully equipped kitchenette in each of the apartments. Remote controlled ceiling fan throughout. Library on the mezzanine floor of The Penthouse. This can be used as a fifth bedroom if required (not suitable for children). Large terrace areas - one covered and one open. Media player with access to nearly 8Tb of movies, TV series, documentaries and music. Mini bars - one in each Apartment, one in the Penthouse and one on the games room level. Panoramic sea, jungle and sunset views. Use of mobile phones pre-programmed with many useful numbers. Perched on the side of the hill, Koh Tao Star Villa is overlooked by a huge granite boulder and there is a temple just behind the villa. With nearly 400 square meters of sophisticated living space Koh Tao Star Villa provides ample accommodation for up to 10 people; Essentially ‘The Villa’ is the combination of the Penthouse on the upper level and two self contained one-bedroom apartments with en-suite bathroom and living room on the lower floor. 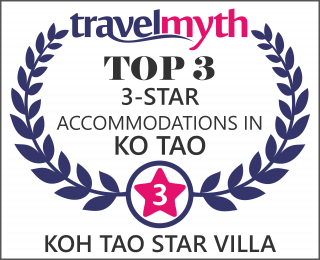 This way, you can stay with your friends and family, but you will not have to live ‘hand-in-glove’ with them all the time..
Koh Tao Star Villa nestles in jungle clad hills overlooking Sairee Beach, the longest and most popular beach on Koh Tao. This superb location, near the end of a private road, gives you peace & isolation, and very easy access to Sairee Beach where there is a huge variety of bars, restaurants and clubs to suit all tastes. Star Villa is less than 5 minutes by scooter or ATV from Sairee and we provide a free taxi service up to 10.30 at night and the use of a mobile phone for your convenience. The Villa provides a total of 4 double bedrooms and 4 bathrooms (plus a toilet down on the games room level). Renting the Villa means the entire place is for the private use of you and your party. The Villa is designed to accommodate up to 8 people. We are off the beaten track – about a 15 minute walk from Sairee town and Sairee beach. The result is a very peaceful location away from the bustle and hubhub of Sairee and yet within easy access of the life and lights of the town/beach. By scooter this trip takes less than 5 minutes and we do provide a free taxi service to the town up to 10.30 at night if you need it. Although the Villa is designed to accommodate 8 people, it can accommodate up to 10 using the library on the mezzanine floor as an extra bedroom. For the sake of clarity, this extra bed is a queen sized inflatable mattress supplied with linen, pillows, extra towels and dressing gowns. Please note that this room is not air-conditioned. It does have excellent fans for cooling but there is no air-con. The air-con units in the bedrooms are designed for and are the right power to cool the bedrooms only. They cannot be used to cool the whole Penthouse. Please note that there is an additional charge for the supply of the extra mattress. The minimum booking period for The Villa is 2 nights. The following prices are nightly rental rates in Thai Baht. For up-to-date currency conversion click here. Please note that the actual currency conversion rate may vary slightly at time of booking. For our ‘long term’ guests please note that we do not provide our normal free daily taxi service to Sairee (as people staying for this length of time tend to require a greater level of freedom anyway and they rent a motorbike or scooter for their transport around the island) – we do still provide a free taxi service to and from the pier when you arrive and depart; also we do not provide a daily maid service – instead we clean every three days (including changing linen and towels) – we do ask that the villa is kept tidy inbetween cleans.